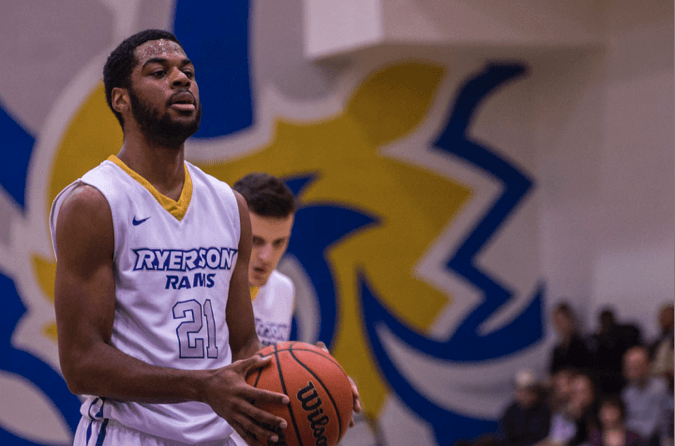 In their second appearance in a Canadian interuniversity sports (CIS) bronze medal game, the Ryerson Rams men’s basketball team defeated the University of Dalhousie Tigers 85-78 Sunday afternoon. Coming off their semi-final loss to the Calgary Dinos, the Rams were able to bounce back, and thanks to the depth of the Rams bench — with all nine players getting on the scoreboard — Ryerson was able to capture another medal to cap off their historic year. Starting with the duo of Adika Peter-Mcneilly and Aaron Best, who combined for 26 points, the Rams were able to jump out to an early one point 11-10 lead over Dalhousie. With Jean-Victor Mukama hitting two from downtown, Ryerson was able to end the first quarter with a dominant 20-11 lead, keeping the Tigers at arms length for the entire opening frame. The Rams started the second quarter looking much more relaxed than the previous night, shooting 8-120 from beyond the arc, better than the 5-34 they shot against the Dinos, but still not great. And despite the loss against Calgary Saturday night, Ryerson look unfazed and determined to capture a medal, whatever the colour. At half the Rams were able to push to a 45-30 lead, with the strong defensive play that the Rams have been able to work all season, on full display. Yet Dalhousie was never down and out, starting the second half strong, courtesy of guard Kashrell Lawrence who tallied 19 points on the night. At one point the Tigers were able to stay with reach, cutting the Rams lead to 63-41. The fourth quarter also proved fruitful for the Tigers as they were able to come within three points of tying the game, making it 81-78 with two minutes to go. But ultimately the Rams were able to come out on top, winning their second consecutive bronze medal and the title of third best team in the nation. The CIS championships top off a historic season for the team, who’ll now move into the offseason with a gold, bronze and two coach of the year awards to be proud.